Mariquita (Spanish for ‘ladybird’) is the sole survivor of the 19 Metre Class, whose racing career flourished for two brief seasons before the First World War. Designed and built by William Fife at his Fairlie yard in 1911, Mariquita along with Corona, Norada (Nicholson) and Octavia thrilled the racing public from Kiel to the Clyde, where they arrived having braved a North sea gale. After the collapse of the class, Mariquita went cruising and eventually, minus her keel and rig, became a houseboat at Pin Mill, Suffolk. She was rediscovered in 1991 by William Collier, and restored on the Hamble by Fairlie Restorations in 2004. Collars became involved in the project early on, working with the late Harry Spencer in supplying the majority of the spars as part of her restoration. 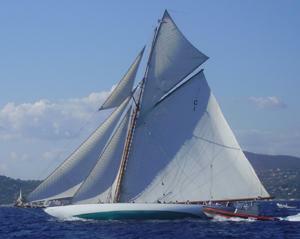 Although she spends most of her time racing in the Med displaying her instantly recognisable sail number C1, she has regularly returned to the UK for Classic Regattas including the Fife Regatta in 2008.